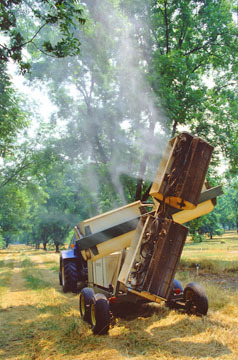 Pesticides are frequently found in surface and ground water. That statement, although true, does not by itself give a complete picture of the situation. After decades of testing water for the presence of pesticides, very few samples have been found to contain enough pesticide to be a human health concern. Rarely are concentrations found that could affect small aquatic organisms or animals that feed on fish. The National Water Quality Assessment Program (NAWQA) has published a report of pesticides in streams and ground water located here: http://pubs.usgs.gov/fs/2006/3028/. Absorption is the uptake of pesticide molecules into plant tissues. This action removes the pesticide from the environment, and prevents the pesticide from becoming a water contaminant. Adsorption is the physical binding of pesticide molecules to soil particles. The strength of the bonds depends on the interaction of the pesticide’s chemical properties, its concentration in the soil water, the soil pH and the composition of the soil (percent sand, silt, loam, clay, and organic matter). 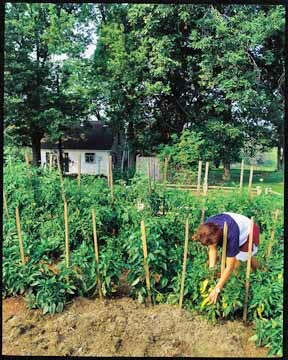 If bound to the soil, the pesticide is unlikely to leach or runoff. Some highly soluble pesticides bind strongly with soil. The more clay particles and organic matter that are in the soil, the more the pesticide is held by the soil and becomes immobile. Strongly adsorbed pesticide molecules do not leach or move unless the soil particles to which they are adsorbed move (erosion) with water. The longer the molecules of a pesticide are held, the more likely it is that microbiological degradation will occur, which reduces the risk of leaching and runoff. Erosion is the movement of soil particles from the application site by heavy rains or excess irrigation. If the pesticide is adsorbed to the soil particle, the pesticide is also being moved off site. Movement in runoff water occurs when soluble or insoluble pesticides move from the application site across the soil surface, either dissolved or suspended in runoff waters. Pesticides dissolved or suspended in runoff water may quickly reach surface waters such as lakes, streams and rivers. The water solubility of a pesticide will determine how readily the pesticide will dissolve in water. A highly soluble pesticide has a greater potential of being washed from any surface it has been applied to. Solubility is usually expressed as the maximum amount of pesticide that will dissolve in 1 liter (1.06 quarts) of water. Water solubility is measured in milligrams per liter (mg/l), which is equivalent to one part per million (ppm). The larger this number, the more soluble a pesticide is in water. Leaching to groundwater occurs when soluble pesticides move downward through the soil to the groundwater. A highly soluble pesticide will tend to readily leach into groundwater. Degradation: As soon as the pesticide is applied, it begins to break down or degrade into simpler compounds which are usually less toxic. Each pesticide has its own speed of degradation, which depends on the active ingredient, the formulation, and environmental conditions. There are both benefits and drawbacks to a long degradation time. The longer a pesticide takes to break down, the longer it is present to control the insect, weed, or disease for which it was applied. This is called residual activity. One drawback to extended residual activity, or persistence, is that the pesticide may also be available for leaching or runoff over a longer period of time. Photolysis (photocomposition): The degradation of chemicals by light is called photolysis, or photodecomposition. Photolysis occurs on the plant, soil, water, or any other surface that sunlight reaches. Hydrolysis: Water also degrades pesticides by dividing large molecules into smaller ones, breaking them down in the process called hydrolysis. Hydrolysis of pesticides can occur on the soil surface, in the root zone, or whenever a source of water is available. Hydrolysis may be very active in warm water at or near the soil surface. As the water temperature cools at depths below the root zone, the rate of hydrolysis slows. In deep groundwater, hydrolysis slows dramatically. Microbiological Degradation: Microorganisms break down or degrade pesticides after application. Most microorganisms-a category which includes bacteria, viruses, fungi, algae, and protozoa-live in the upper foot of soil where they find warm temperatures, moisture, and organic matter, and where they do most of their work degrading pesticides. Microorganisms are most active in soils having high organic matter. As the pesticide moves down below the root zone, microbiological degradation decreases because of less favorable living conditions for the microorganisms. Pesticides in the Nation’s Streams and Ground Water – The results of more than 10 years of study by the National Water-Quality Assessment (NAWQA) Program. Provides a national-scale analysis of pesticide occurrence in streams and groundwater.